The fourth installment of our traveling hackathon and speaker series was held in Boston, MA in partnership with Harvard Innovation Lab, along with support from Everyone Hacks, Interface Foundry, Hack/Reduce and Oracle Academy. The weekend event kicked off with a intimate workshop, "How to Rock Your First Hackathon," for first time hackathon participants to learn ways to successfully contribute to a team using their skills and have fun. 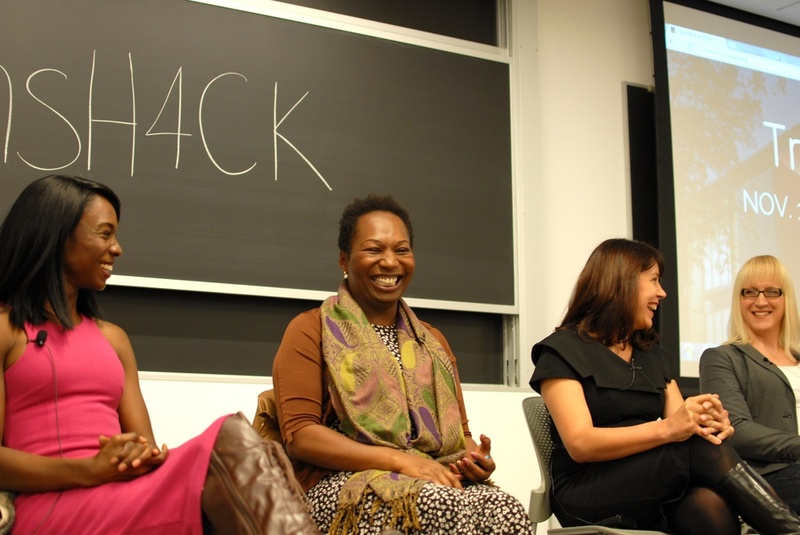 In keeping with the Harvard i-Lab's theme of entrepreneurship and innovation, Friday evening featured a panel conversation with transgender founders of tech companies and social enterprises. The discussion touched on a range of topics, such as the need for trans people to to hold leadership roles in for-profit entities to expanding diversity in tech conversations to include all types of genders. The next day, the hackers gathered to pitch ideas, form teams, and begin working on their projects. Ideas ranged from an app to spotlight trans people to an interface that makes REFUGE Restrooms more accessible through mobile platforms. At the end of the two day hackathon, six teams presented their projects to a panel of esteemed judges ranging from software engineers to Harvard faculty. The winning team, pitched the concept for an app called FITTED, which helps trans people (and everyone else) find jeans online according to their body type. The team drew from their own personal experiences as well as data collected over the weekend to design their prototype. A platform that highlights individuals, organizations, events and projects that are created by trans leaders in an effort to address the much asked question: Where are the trans professionals or trans-led projects? An app that rates healthcare providers & data collection to serve the health needs of the transgender community. Simple to use form site that contacts conference organizers to encourage and recommend diverse speakers. Send a Yo to YORESTROOMS and find the closest gender safe bathrooms using REFUGE Restrooms data. Trans*H4CK is a fiscally sponsored project of City Incite and a product of ZaMFunds, Inc.